We’re not saying we’re the best location on the shores of Loch Lomond but we’re certainly in the ‘top one’ of luxury holiday accommodation this side of Scotland! 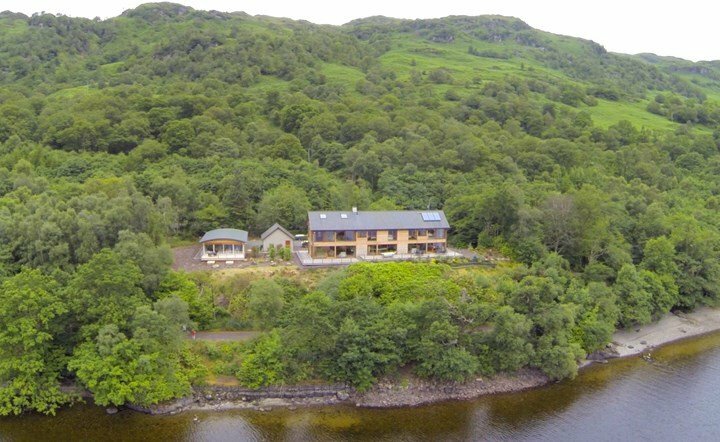 Situated on the “Bonnie Banks” of Loch Lomond, Auchenheglish Lodges offers 19 individually styled luxury self-catering cottages each with its own unique view. On the water’s edge, our holiday homes offer privacy and seclusion, with spectacular vistas across the water to the islands and mountains beyond. We have our own private jetty and our properties boast the highest standards allowing you to indulge in luxurious living with quality soft furnishings and bed linen, en-suite bathrooms and fully fitted kitchens you’ll want for nothing. Stay entertained with free WIFI, large screen TV’s and DVD players, full Sky satellite packages in most of our properties and Freeview in 4 of our properties. All our properties are smoke/pet free. Travel Times Approx by car – Glasgow 40min – Glasgow Airport 25min – with a short drive north to the Highlands and the west coast. 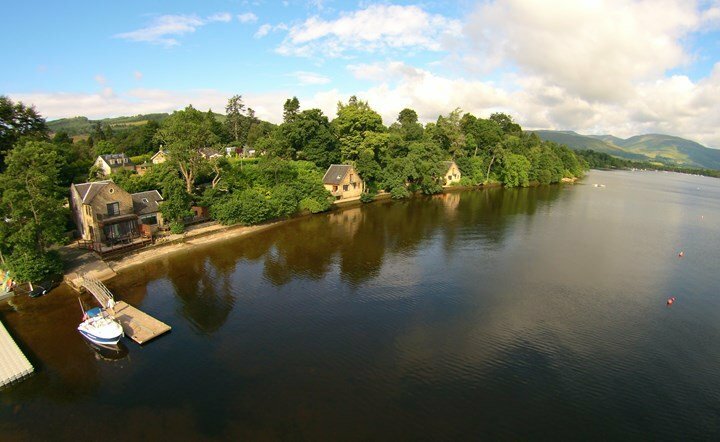 Nearby to Auchenheglish Lodges on Loch Lomond are several villages and small towns such as; Luss, Balloch, Helensburgh, Arrochar and Tarbet. There you’ll find numerous Inns, Restaurants and Bars offering an excellent choice of food and beverage. Our guests can access the nearby five-star Cameron House Resort. Their Leisure Club facilities include Golf, Swimming Pool, Spa, Jacuzzis and steam rooms, Tennis and Squash Courts. (admission fee charged on entry). Or take to the water for a cruise enjoying the breathtaking views, we’re delighted to offer our guests a 15% discount with Cruise Loch Lomond. From our holiday homes, it’s never been easier to enjoy the outdoors with numerous walks and cycle tracks easily accessible offering stunning views of mountains, lochs and islands. There’s also an abundance of wildlife in the area too. Ospreys are regularly seen at our lodges diving for fish as well as otters, diving grebes and a wide variety of birdlife. A complimentary starter pack and bottle of wine is included for you on arrival. A visit to one of our holiday homes will be a memorable experience and a warm welcome awaits you from Liz, Wendy and Graham. Within the exclusive Arden Estate and accommodating two people this property, originally built in 1868, has been fully restored to offer a wonderful light and spacious holiday home, boasting an enclosed private garden area and cobbled courtyard complete with garden furniture and BBQ. In contrast to The Smiddy this cottage presents high ceilings and natural wood flooring throughout the large downstairs open plan lounge and dinning area with fully fitted kitchen. A hardwood staircase leads to the gigantic king-size en-suite bedroom. Like all our accommodation The Stables is inclusive of full central heating, telephone, full sky tv package in all rooms, dvd player and free wi-fi. The private 12-acre Arden Estate hugs the shoreline of Loch Lomond and The Stables is nestled within tranquil gardens just 200 yards from the water’s edge with footpaths leading down to the loch side where you can stroll along the shore. The area itself is conveniently situated near the villages of Luss and Balloch with restaurants and bars a short walk away including the nearby Cruin restaurant/bar which overlooks the water and is just a 10 minute walk. A path along the lochside also offers a walkway to the nearby town of Balloch. 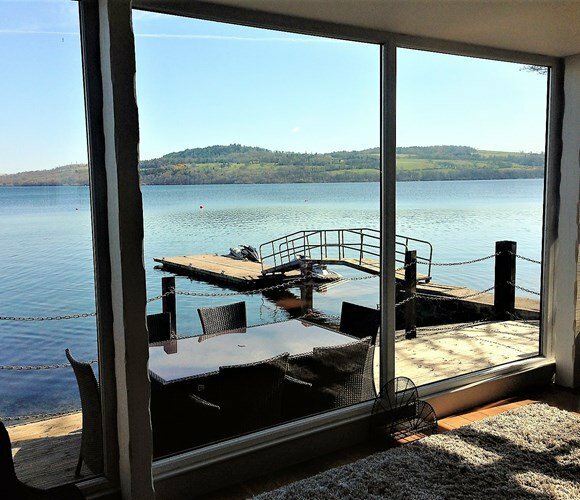 Stunning large contemporary house on the shores of Loch Lomond with fantastic views of the water from all rooms. 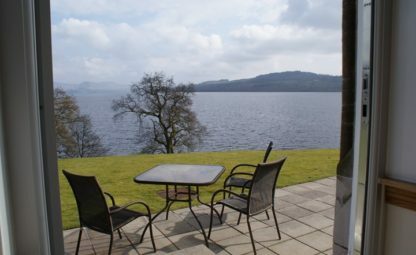 Situated in the national park six miles north of Luss and looking across the loch to Ben Lomond and the mountains beyond it offers an ideal location within the park as a base for a holiday in one of Scotland’s most beautiful and scenic areas. Corporate membership to THE CARRICK SPA / LEISURE AND GOLF CLUB LOCH LOMOND is included with this property. This is a fantastic package offering daily use of these facilities for four people with the added facility to sign in guests at a much reduced rate including 20% off all food and drink in the restaurant and bar. This membership is worth in excess of £200 per day. Accommodation is extensive with 4500 square feet comprising on the ground floor of large kitchen breakfasting room, laundry, dining room, hallway, toilet, large lounge with gallery above, pool table and table tennis on the lower level. The upper level comprises of 4 en-suite bedrooms [all king size beds] one of which is situated in the gallery and a fifth bedroom with twin beds or queen bed upon request. There is plenty of storage and wardrobes in all rooms and a large hallway on the upper level. Total accommodation sleeps 10. Hardwood oak flooring throughout with under floor heating, modern décor, quality furnishings throughout, sliding patio doors from all downstairs rooms lead on to a large deck overlooking the loch, garden furniture and BBQ. Full SKY PACK with movies/sports and two sky boxes, sound system, 64 inch tv in lounge, 54 inch in kitchen and 42 inch in master bedroom, unlimited broadband, large fully fitted kitchen and laundry,baby grand piano, electric gates leading up a private driveway to ample parking. Jetty Lodge accommodates 4/6 people. 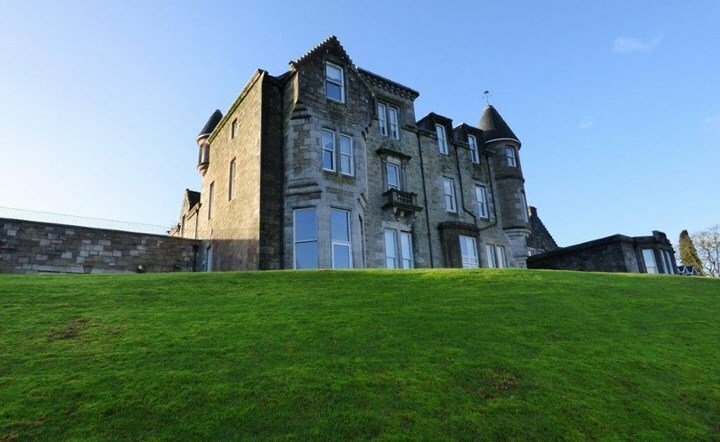 It has a king size en-suite bedroom, a large lounge and full length balcony overlooking the loch on the upper level. There is a second king size en-suite bedroom with a spacious downstairs lounge and sofa bed, dining area and fully fitted kitchen on the ground floor level leading through French doors to a large waterside decked patio with furniture, barbeque and beach. All rooms have loch views, satellite TV telephone and central heating. Situated on the side of the loch set in 6 acres of private gardens which extend to the water’s edge “The Pipers” No7 Lomond View accommodates up to 4 people on the first floor of this exceptional grade B listed 18th Century Lomond Castle. Consisting of entrance hall, spacious lounge/dining area with fully fitted Kitchen and a comfortable sofa bed. King size bedroom with Jack and Jill bathroom which can be accessed via bedroom or hallway. The interior is smart, fresh and contemporary and furnished to the highest standards; inclusive of Smart TV, DVD player, Wi-Fi and full central heating. 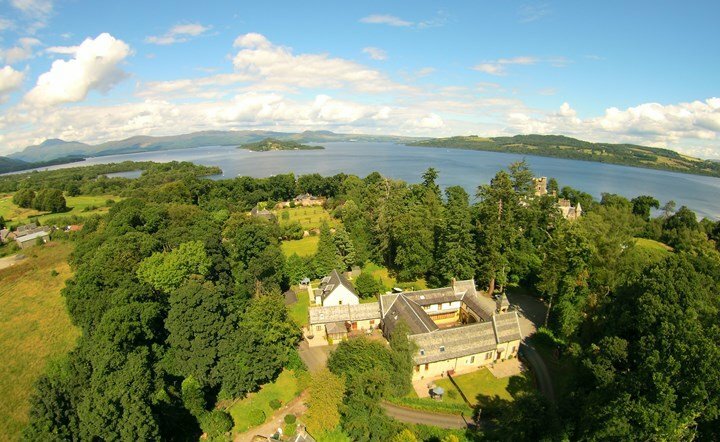 Lomond castle is conveniently situated close to Balloch / Loch Lomond Shores and Luss with only a few minutes’ walk to the nearest restaurant and bar. Ideal for longer stays or short breaks; a peaceful and tranquil holiday break for touring picturesque Scotland, walking, golfing and an array of Water activities can be found around the loch. The apartment is located on the West side of the Loch, only 30 minutes from Glasgow and Glasgow Airport. Carriage Lodge we are proud to say is second to none. 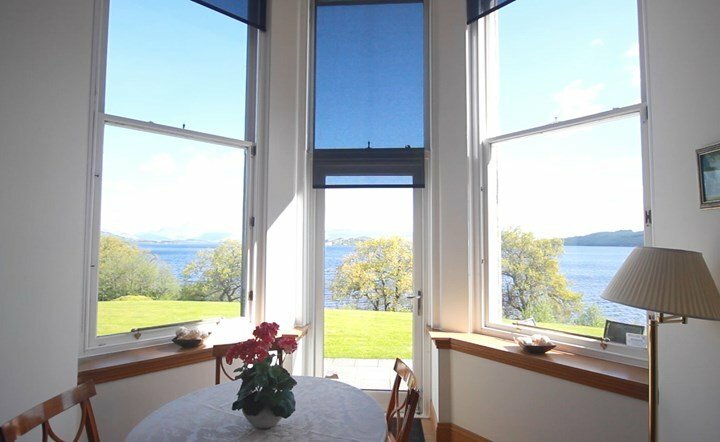 Originally part of the coach house to the magnificent Arden House and nestling in its estate, a five-minute walk will take you to the banks of stunning Loch Lomond. 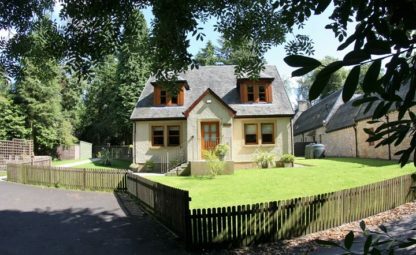 With 4 large bedrooms and 3 bathrooms The Carriage Lodge is the perfect 5* self-catering property for larger groups of family and friends looking to experience a relaxing break in a beautiful location. 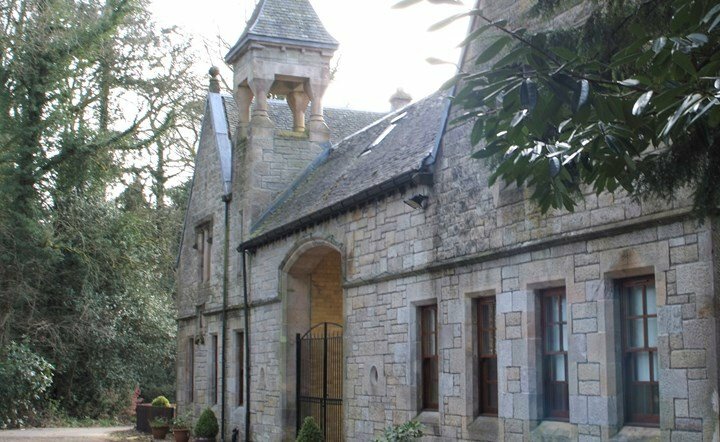 The original building was constructed in 1868, but internally the Carriage Lodge offers all the comforts you would expect in contemporary accommodation. The Carriage Lodge offers a perfect location. Its setting is tranquil and peaceful but it also benefits from easy access to everything the surrounding area has to offer. 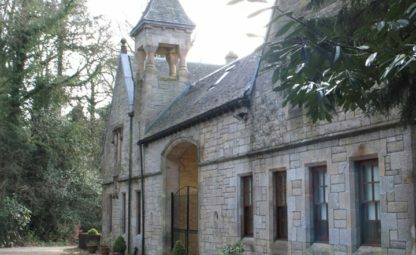 The property is accessed by way of a gated archway leading to a pretty courtyard area. Inside four lovely bedrooms can accommodate 10 guests in luxurious comfort and the stunning lounge is a perfect place for family and friends to gather after a day exploring the surrounding area. Outside, the large private garden and patio area offer another place to relax and unwind. 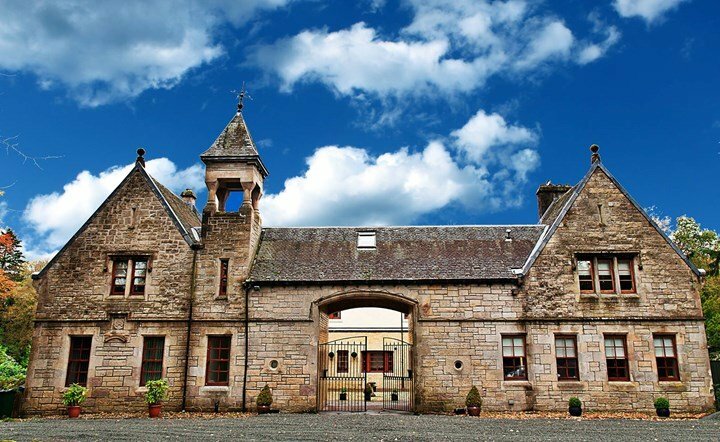 The Carriage Lodge is only a 20-minute drive from Glasgow Airport and is 5 minutes from Balloch, where an array of inns and restaurants can be found. 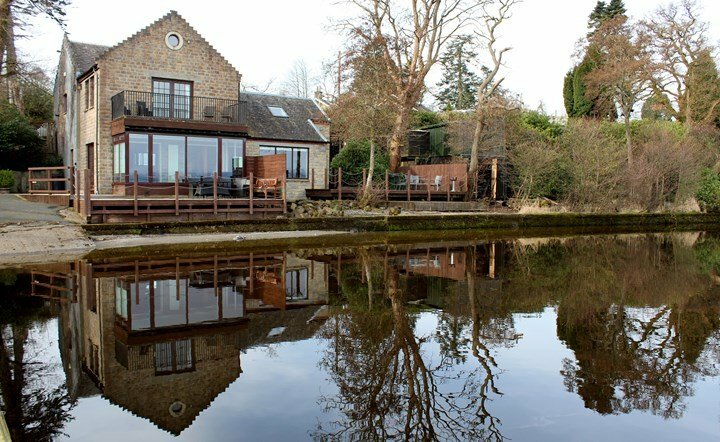 The “Cruin” restaurant and bar is within walking distance, as are Duck Bay Marina and the internationally acclaimed Cameron House Hotel and Carrick Spa & Golf Resort.